A new Stunning freehold development situated at Singapore sought after District 19. 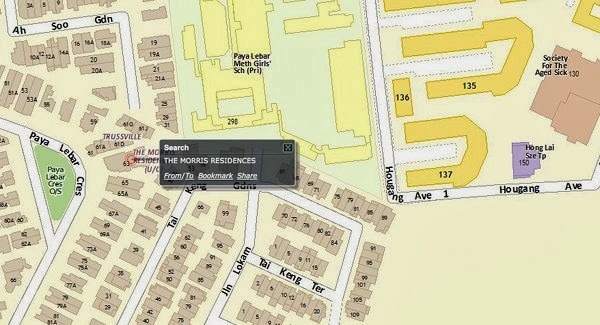 The Morris Residences is located at 63 Paya Lebar Crescent, District 19 with close proximate to Bartley, Kovan and Tai Seng MRT Stations.Drivers have easy access to Kallang Paya Lebar Expressway(KPE) and Central Expressway (CTE).Commuters, there are buses to Toa Payoh, Bishan, Eunos and Ubi. Within the vicinity there is Nex Shopping Mall , Heartland Mall and nearby ANK hub. Residences with school going kids are spoilt with choices of renowed schools nearby such as Paya Lebar Methodist Girls' Primary/ Secondary School, Bartley Secondary School, St Gabriel's Secondary School and Maris Stella High School.